The recreational boating industry’s year-long rebound cooled in September, but the annual end to warm summer weather in much of the nation may have been more of a coincidence than a cause. Sales in the industry’s main powerboat segments were virtually flat, rising just 0.3 percent, to 3,776 boats, from September 2011 and industrywide sales fell, though only 1.7 percent, to 5,954 boats. With sales of aluminum fishing boats falling 2 percent, to 1,025 boats — the first monthly drop all year in that category — and sales of 11- to 40-foot outboard fiberglass boats, an industry leader for months, rising a slim 1.2 percent, to 1,470, the question was whether September’s numbers represent flagging seasonal interest from consumers or a weakening of the market. “I think the market is slowing, not because of seasonality but because of the economy,” Statistical Surveys president Tom Walworth said. “It’s a soft market out there,” Walworth added. With unemployment at about 8 percent and a national economy that is growing only about 1.6 percent, “I think it’s fantastic that [the marine industry is] performing as well as it is,” he said. Categories that have struggled in recent months continued to do so. Sales of 14- to 30-foot inboard and sterndrive fiberglass boats fell 8.7 percent in September, to 428, and sales in three categories of cruisers and yachts dropped by margins ranging from 15 to 46 percent. The September data were based on information from 22 early-reporting states that comprise about 60 percent of the U.S. boat market. Ryan Kloppe, national marine sales manager at Statistical Surveys, said September sales represented 5.4 percent of the total annual market last year. Reported sales of documented vessels were complete only through June 30 because of data entry delays at the Coast Guard, Kloppe said, creating an incomplete report for boats larger than 31 feet and understating the cruiser and yacht markets. Walworth said that once the Coast Guard catches up, the gap between September 2012 and 2011 sales in the big-boat categories will narrow. Although sales of aluminum fishing boats fell in September, sales of aluminum pontoon boats posted a double-digit gain — the only one in any industry category — climbing 11.8 percent, to 794. 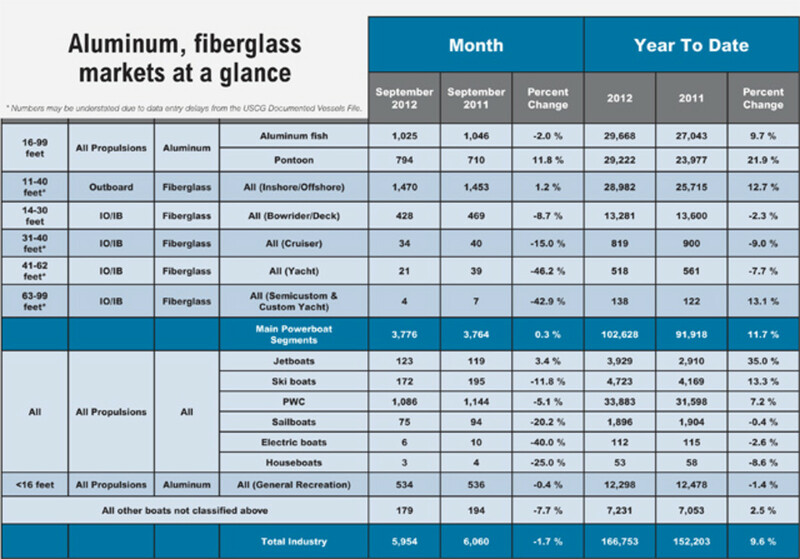 The two aluminum groups had been rising in tandem throughout the year. Walworth said the increase in pontoon sales might be attributable to manufacturers offering incentives to customers who live in states that are now having better weather as they recover from drought conditions earlier in the summer. Sales of jetboats continued to rise in September, gaining 3.4 percent, to 123, but sales of personal watercraft dropped 5.1 percent, to 1,086, and sales of ski boats tumbled 11.8 percent, to 172. Despite the lackluster September numbers, sales through the third quarter are up 11.7 percent in the main powerboat segments, to 102,628, and 9.6 percent industrywide, to 166,753. Walworth said fiberglass and aluminum boat sales in upper Midwest and North-Central states such as North and South Dakota, Michigan and Montana have been above the national average.